With a long reputation for endurance and strength, chain link is one of the most widely used fence systems today and offers cost effective and economical solutions for residential, commercial and industrial applications. At Budget Fence and Gate Systems we’ve been installing galvanized chain link fabric for over 65 years, and our systems are the industry benchmarks for quality, value and durability. Choose from our wide selection of fabric, framework, gates and accessories to create the perfect system for your needs. Chain link fencing allows total visibility, and combined with landscaping it provides an attractive visual barrier while maintaining boundary security. Let the experts at Budget Fence and Gate Systems find a fence to suit your style, your property, and your budget. There are many practical uses for a chain link fence: to gain boundary security, safely corral kids and pets, and prevent unsupervised dips in a swimming pool. But the right fence also makes a strong aesthetic statement, dramatically improving a home’s curb appeal. 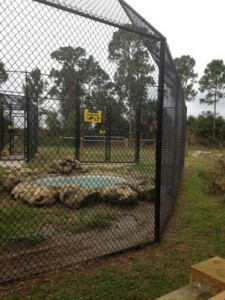 Chain link fencing is in most cases the most cost effective solution to accomplish these practical goals. 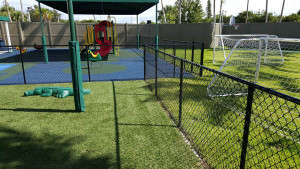 We can install chain link fencing in heights of 36”,42”, 48”, 60”, 72”, 84”,96”,120” and 144”. They can be installed in many different gauges or strengths, sizes and thicknesses of framework, and posts. Chain Link fences can be installed in many different colors, and with different accessories such as privacy slats, windshield fabric, and landscape inspired privacy accessory slats. We specialize in security fences with barbed wire, razor wire, or concertina wire. We offer safe and secure gates, secure storage facilities, territory borders, and inventory protection. These commercial style fences come in the same heights as mentioned above. We can install pedestrian walk gates, estate driveway gates, commercial and industrial entrance gates, roll or slide gates, and cantilever gates. All of our gates are welded in house for added strength, precision, and integrity. You can also choose to have any of these gates automated with gate operators and access controls. Which Type of Chain Link Should I Choose? This product also comes with an industry best 15 year product warranty and is considered very low maintenance. (Double Protection) With PVC vinyl coated fabric, you are assured of a double coating of protection. Before the wire is processed through the vinyl coating line, it must be coated with zinc by either the hot dip or electrolytic process. The finish color vinyl material is then extruded or fused onto the galvanized surface, giving the fence a double coating of protection along with the lasting beauty of color. We insist on GAW (Galvanized After Weaving) and so should you. Nothing beats the complete zinc coating of GAW chain link fabric for durability and rust prevention. Our chain link fencing material comes with an industry best 15 year product warranty and meets the demanding requirements of ASTM Specification A392. Upon request, it can also be ordered with a heavier gauge that comes with a 25 year product warranty. It’s also considered a very low maintenance product. GAW also provides the best protection against corrosion in even the most severe coastal climates. Hot dip zinc galvanizing is a simple process with over 200 years of proven effectiveness in millions of projects worldwide. There are other zinc galvanizing processes and metallic coatings, but none surpass GAW in durability and protection. It’s a premium product providing superior corrosion and rust resistance that doesn’t cost a premium price. Fewer long term maintenance problems mean lower long term costs and greater life cycle savings. Pound for pound GAW fabric is by far the greatest value. Our highly skilled, trained, and experienced installers can meet with you at the commencement of your installation to go over specific details you’re looking to accomplish. If you have special concerns regarding small dogs, or steep elevation changes, our installers are trained to give extra attention when needed to address your concerns. Our installers fully understand the importance of pool enclosure safety and security, and are extensively trained in pool code compliance. Meet with one of our knowledgeable project design consultants to assist in carefully considering your choices. Our experienced project design consultants can meet with you to discuss any design elements you wish to incorporate into your installation. We will listen to your ideas, needs, or concerns to provide a comprehensive plan of action to accommodate them. Throughout this process, we can provide pictures, installation techniques, and recommendations as a solution to your project. Our project design consultants are trained to address pool code compatibility, grade and elevation changes, and unique scenarios with your individual property. If you follow our recommendations, you’ll be looking at that fence- and enjoying it for many years to come. We are a proud member of the American Fence Association, with one of our employees having served as the president for the association. With every chain link fence installation we provide, we follow the guiding principles of this organization for best industry methods and practices. We also incorporate our decades of experience, to know what methods of installation have the best and most proven track record for Southern Florida more specifically. If you are looking for any type of chain link fence, gate, service or repair in Palm Beach, Martin, or Broward County, Please call Budget Fence and Gate Systems at 561-793-6404.